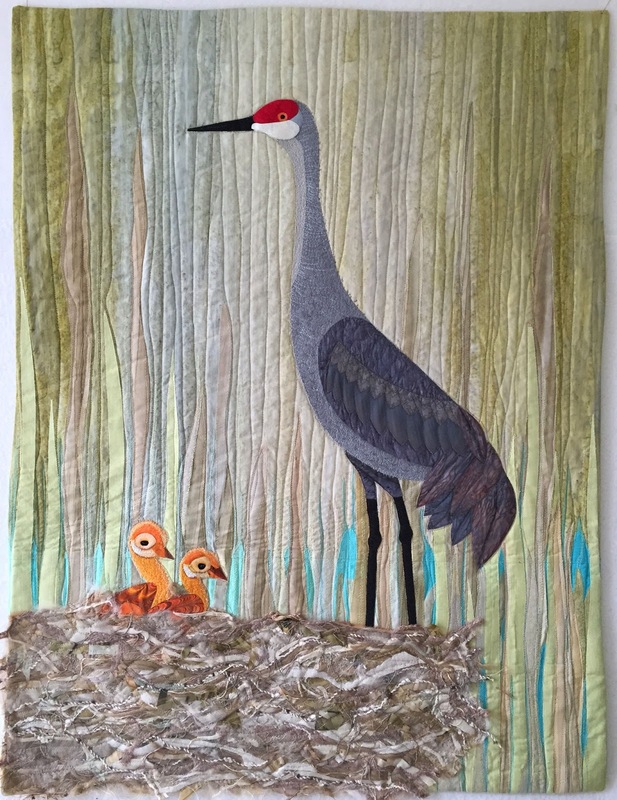 The nest art quilt with the Sandhill Crane is done! I'm showing you a few of the steps that got it to the finish line. The ombre blue fabric for the pond was pieced into the background. 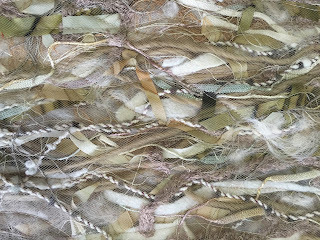 Then I fused pieces of the grass fabrics on top. The top of the pond felt too jarring, as one of my friends confirmed and as you can see below. I love having an independent set of eyes to give me feedback. Do you have your friends give you advise too? With more slivers of blue fabric and several colors of thread, it looks more realistic. 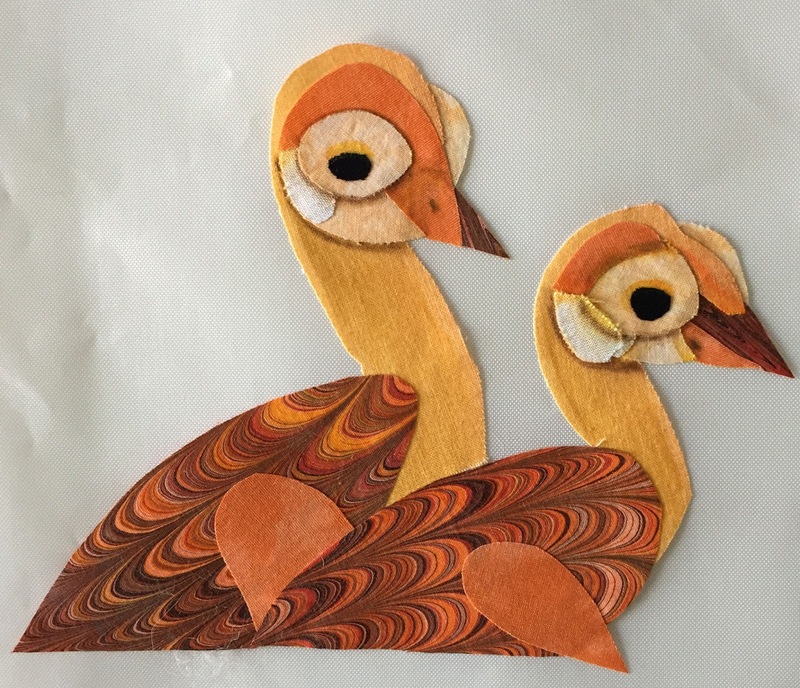 The birds were fused to the background, then stitched with invisible thread to secure them permanently to the background. Then I added thread details. The look of the pond is much better, don't you think? 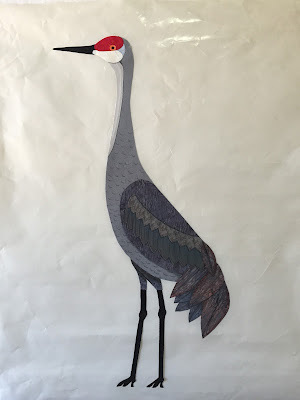 The bird was thread painted and then the quilting was added. I added a facing and then the nest finally got added. I loved the last piece (nest #19) that I did with pieces of the nest hanging off the edge, so I duplicated that feeling with this quilt. I'm in the countdown towards my shared art show with Wilson Cady, who is an avid birder. I asked for permission to make a sandhill crane art quilt using his photos as my inspiration. 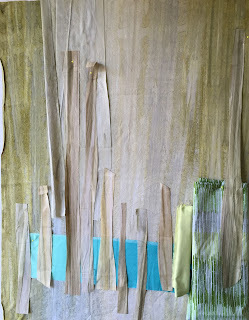 So this quilt is a nod to his photography, while keeping within my series of imagined nests. A little background: The first time that I saw a Sandhill crane, I had no idea what I'd seen. There were two of them in an open field inside of Grand Tetons National Park. As my husband and I approached them on our hike, they took off, so we just barely got a glimpse of them. Later on, we saw them in a marshy area and the picture we got was so blurry by the time it was blown up, that we weren't sure what it was. 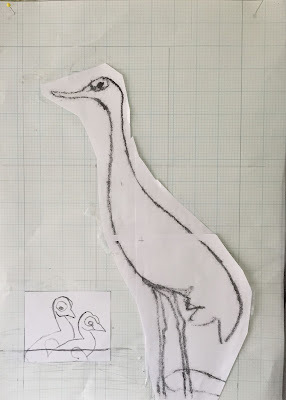 All we knew was that they were big, had long necks, and had red on their heads. Later on, we figured out that we'd seen a pair of Sandhill cranes. 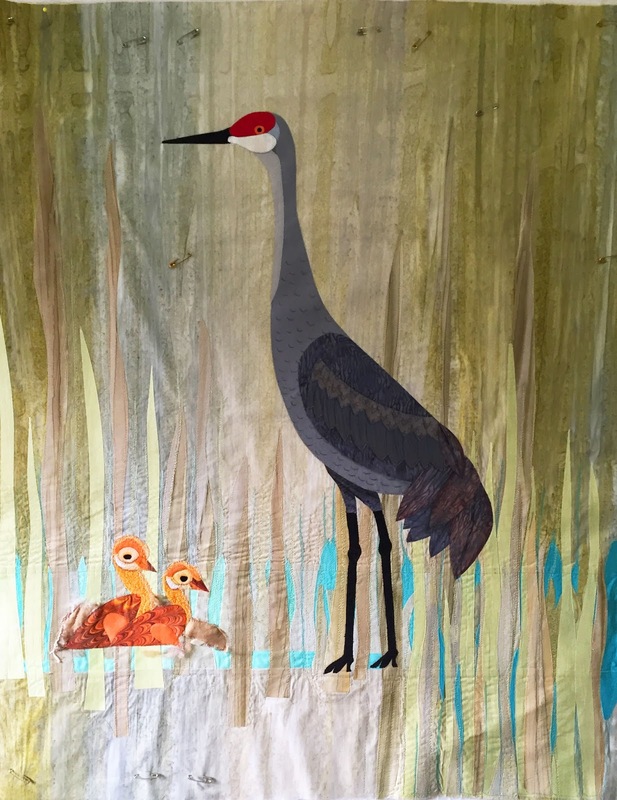 OK enough about the bird, onto the nest art quilt. 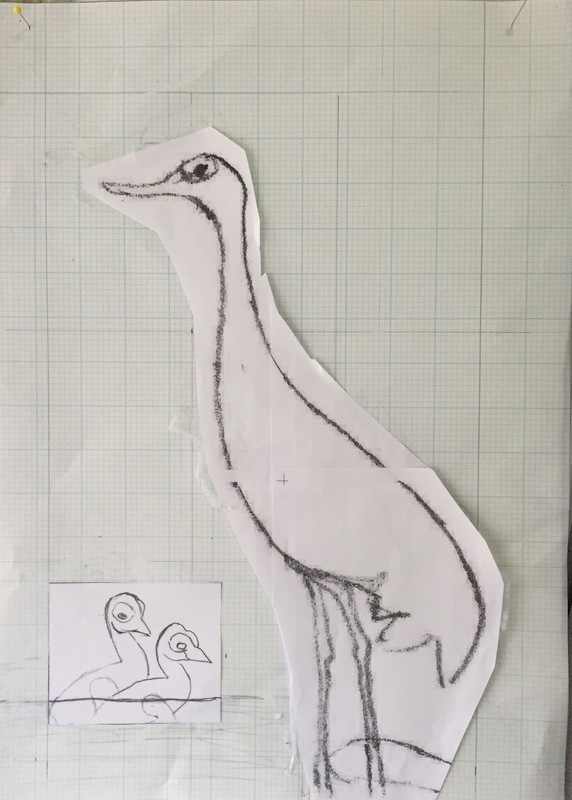 I sketched up a few ideas, traced a bird from Wilson's photo and then flipped and enlarged it in Photoshop. I decided to make this piece twice the size of my other nest art pieces. 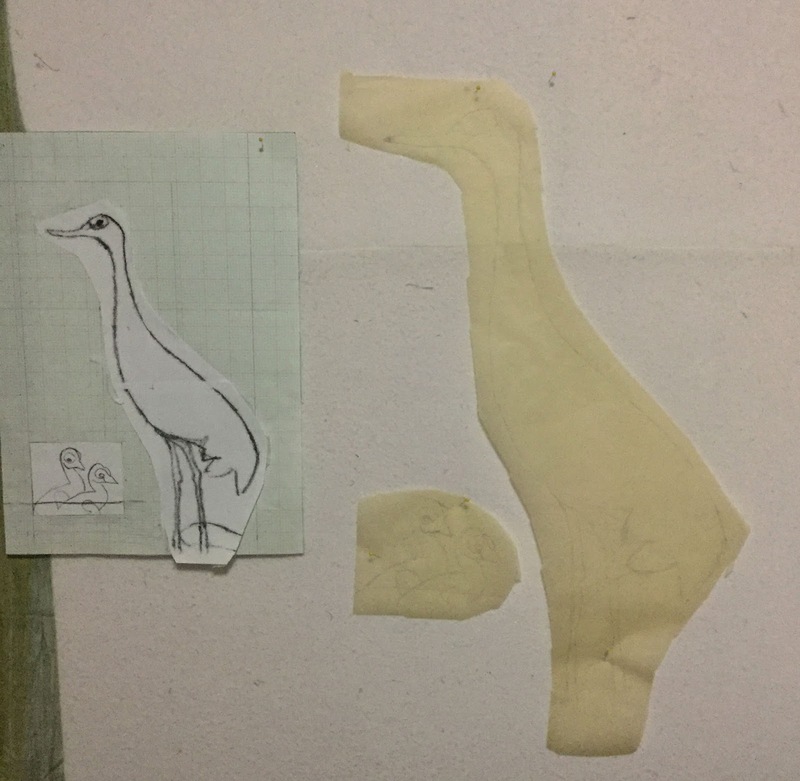 Partly because the bird is so large, and partly because I have a bigger machine to quilt with now! 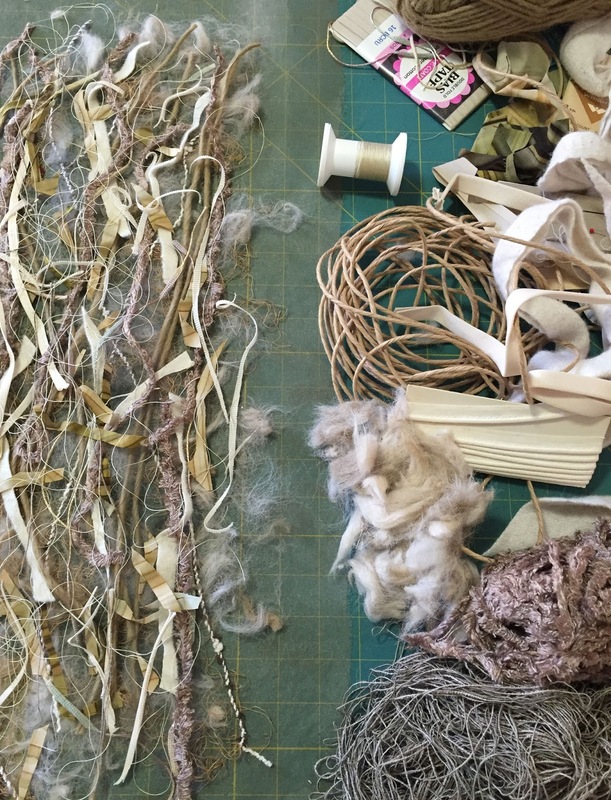 The fibers for the nest included fancy yarn, shredded fabric, felted wool, raw alpaca fleece, bias binding, vintage piping and thread. I sandwiched the fibers between a layer of organza and a layer of gray tulle, then lightly stitched them together. This nest is huge, and I made it as a big rectangle to trim to size later. I often find a great background fabric already in my stash. I'm not sure where I bought this one, but it works. 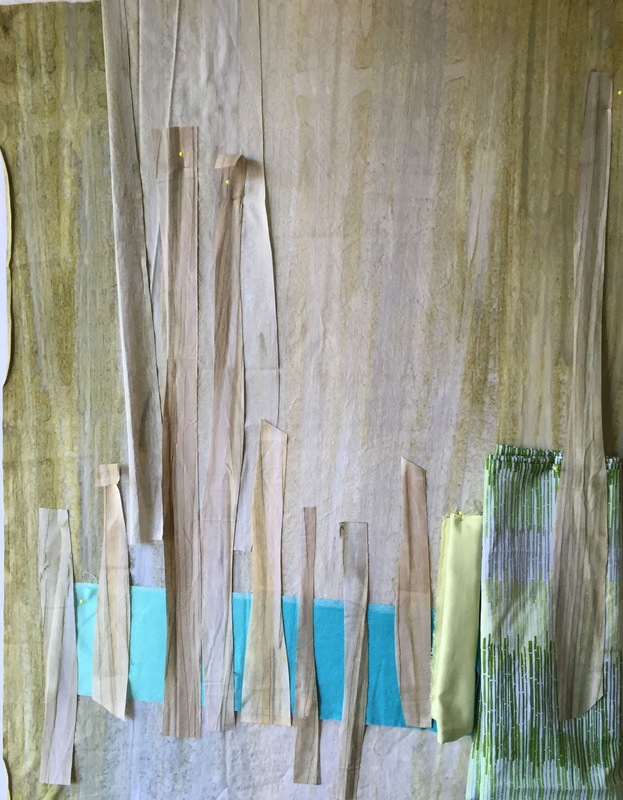 I loosely placed other fabrics on top to get an idea of what the background might become. 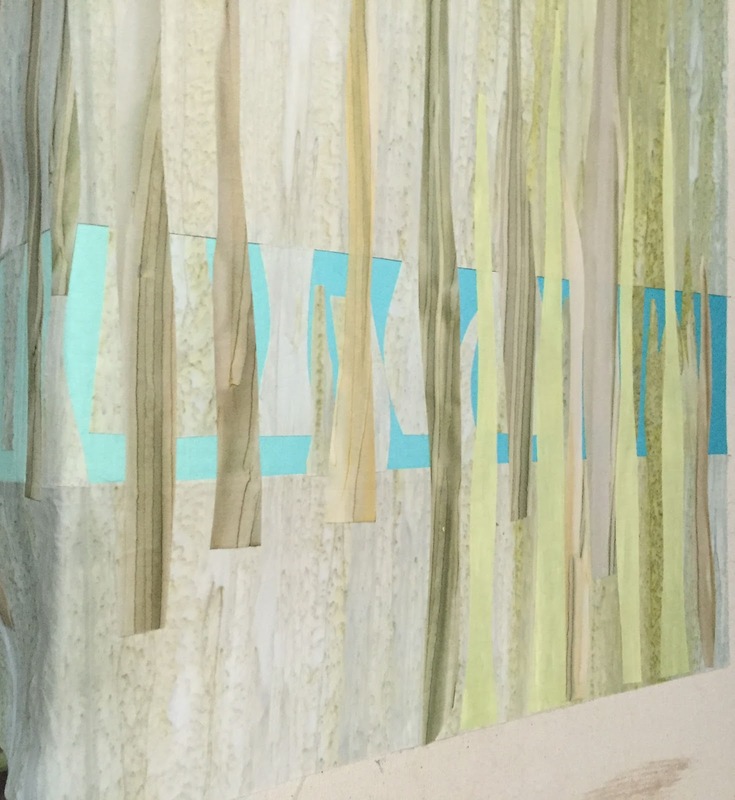 Here is a progress shot showing the loosely placed materials. 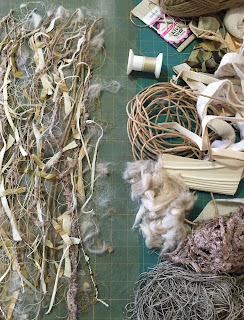 At this point in my design process, I'm never quite sure how it's going to get sewn together. What method would you use for this background? 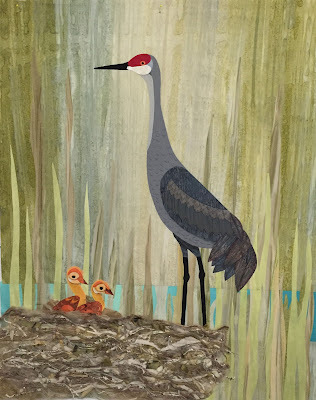 Here are the baby birds and the adult crane after the pieces were fused together. I hope you like it so far! I have been wanting to be able to enlarge my designs quickly. 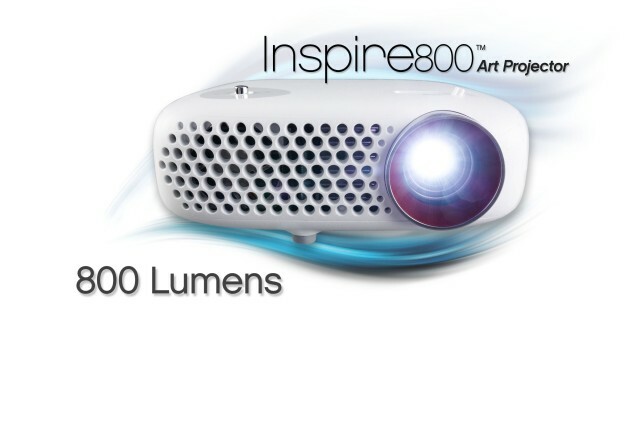 I didn't want an overhead projector and discovered that Artograph has produced a small projector that connects with my IPhone and IPad and Computer. How great is that? Have you ever discovered that every electronic device is more complicated than it needs to be? That none of the cords that come with the device nor your existing cords will work? That the instructions are so vague, and yet so detailed that you can't just do one simple thing? That you have to go to several places to find and print the instructions? OK, enough of the rant. I'm sure that when I get used to using it, I will sing it's praises. Anyway, today I got the connector (lightning to HDMI) that I needed to actually connect the Iphone and Ipad to the projector. It worked like a charm. 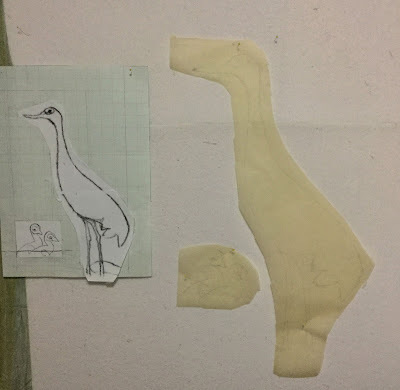 I was able to enlarge a photo of a sketch right to my design wall and trace the design to the right size that I needed to fit my background. When I discover other neat things about the projector, I'll maybe write another blog about it, but for now that's all I have to report. I finally did it! I purchased an Innova sit down quilting machine! I've wanted to be able to quilt without wrestling with my quilts for a long time. A few years ago, I bought a Bernina 820. I'm a dyed in the wool Bernina fan, and I thought that machine was exactly what I needed and had coveted it for a couple of years. It had the larger throat space that I wanted. But I couldn't change the bobbin thread and bobbin tension easily. I was so frustrated by the inability to quickly and easily change the bobbin threads and bobbin tension that I sold it to a friend of mine who doesn't change thread in the bobbin all the time like I do. She's much happier with the machine. Since then, I've looked at several models of sewing machines with larger throat space, but they were mostly more sewing machine that what I wanted. 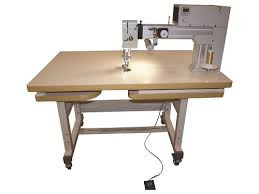 Then gradually a lot of companies started coming out with mid-arm quilting machines. For quilters like me. I know so many people that love their Innova long arm machines, and I heard testimonials from quite a few people who now use the Innova sit down model. So when the local dealer was at our quilt show, I tried it out and loved it. I knew it was just what I wanted! Aah, here is nothing like working with other quilt guild members to put on the annual quilt show. 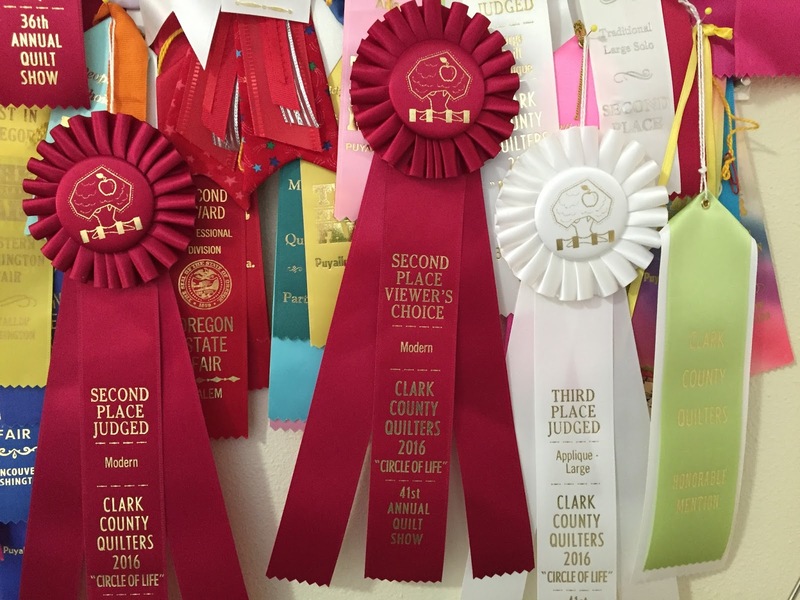 This year, Clark County Quilters held their show at a new venue - the Clark County Event Center (better known as The Fairgrounds). I was fortunate enough to be able to help plan the layout, help with set-up, and help out all 3 days of the show. Volunteering like this has enabled me to get to know so many members of the guild, who are so wonderful and supportive. It is so fun during the show to see friends from other cities come and see our creations and vote for their favorite quilts. Quilters like me are tickled pink when family members show up too. The vendors were fabulous this year, and in my next post, I'll let you know about my special purchase! Of course, I also like to compete for the ribbons and am thrilled for everyone else that wins ribbons too. I am also excited to see the first time entries and the youth quilts. 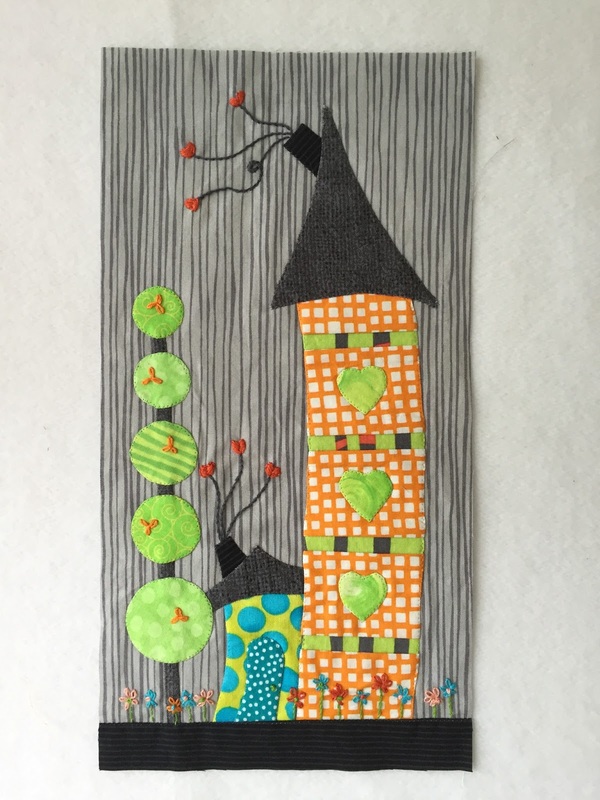 This year, I won second place from the judges and viewers in the modern quilt category. 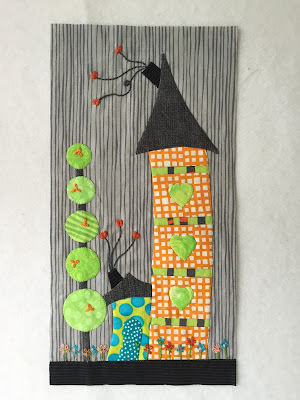 I won third place from the judges in the applique category, an honorable mention in the modern quilt category, and first place in the block contest. Wow, so 5 more ribbons to add to my collection. I hope you decide to join a quilt guild, if you haven't already, and enter your quilts into the shows.